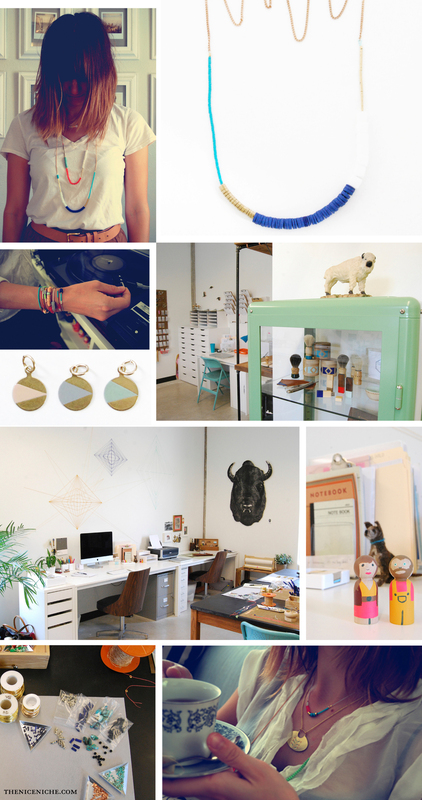 William Knopp and Jessica Tata are the husband and wife team behind Son of a Sailor Jewelry and Son of a Sailor Supply. The birth of the brand is inextricably tied to their own relationship--when they first met and began designing together, Son of a Sailor was the organic result. They remain focused on the story behind the designs they create and materials that they use. The jewelry collections share a signature aesthetic of bold color and lines applied to materials with provenance, such as greek ceramic beads and vintage czech glass. Painted brass is how they made our mark as part of the Classics collection, and they have continued to innovate with beaded pieces and hand-stamped paint-inlayed brass geometric forms. Knopp and Tata introduced Son of a Sailor Supply this year, a line in which their signature aesthetic from their jewelry collection is applied to gift items and men’s accessories. The collection celebrates functional design married with the bold geometric color that has become their trademark. The Jewelry and Supply collections will continue to explore functional, modern design to complement a lifestyle both urban and natural. The lifestyle pieces hope to tell your story just as much as they tell their own. In all aspects, they continue to develop new techniques that apply a modern aesthetic to classic materials with a believe in a convergence of innovation, functionality, storytelling and bright, bold geometry. As their brand has grown, Son of a Sailor has built a small staff of trusty employees, who help them to maintain the detail oriented, handmade aesthetic they've created. As they take on more and more new projects and customers, they've transferred operations into a studio outside of their home. In a new space in a collaborative artist studio building, they've watched their brand continue to grow. In under a year, they're ready to upgrade again---it will be interesting to see where they land!